Munich Franz Josef Strauss Airport (MUC) more popularly called just Munich Airport, since 1992 has been the new airport of the capital of Bavaria, Munich. The airport is named after the former federal Prime Minister Franz-Josef Strauß. 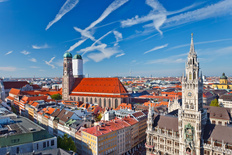 Due to its attractive location and modern technology, the airport is now Luthansa’s second hub after Frankfurt airport. By passenger numbers, the airport is at place seven in Europe. In 2006, it was also voted one of the best airports in Europe by the British Consulting company Skytrax. In 2008, the airport received the prize for the fourth time in a row. The airport was last given the prize in 2010, when it was able to further improve its ranking from fifth to fourth place.